I’ve figured out what feels so strange about this “summer vacation.” Four years ago I decided I wanted to be a doctor. 10 months ago, I finally really started becoming one, building my scientific knowledge base and even working a bit at developing my clinical skill set. And then all of a sudden it’s over for eleven weeks. We’re turned loose unexpectedly. Told by many not to bother pre-studying for next year/the Step 1 and to just enjoy the summer. In high school and in college, summer vacation can be a valuable time for travel and for work experience, either for resume building, or simply because one needs the income. I get that. But in medical school, is this really worth it? I would definitely appreciate 3-4 weeks off to travel or just to recharge in general, but having an entire two months off is weird for those of us who aren’t particularly research driven. It feels like I don’t have enough of a clinical base to do anything worthwhile in the hospital (some people are just shadowing this summer though, and there is funding available for us to do so), and I didn’t get funding to go abroad. I would almost rather just be taking classes again for the rest of the time when I’m not traveling. Well what about those who do want to do research? There’s a few schools (I can think of 3 off the top of my head) that put you through a straight 1.5years of pre-clinical work, with the usual 1-2 week breaks here and there. They then have extra time built in later where students can either choose to do more rotations in the hospital, or to do research rotations, and I really like the idea of that option. Especially since it means this happens later when you know more and can do more useful research in the little time you have, or you can choose to to hone your (actualy existent!) clinical skills. We already have this option during fourth year, so it would just be adding more of the same. Realizing what feels so odd about this summer, I’m going to try to make this a productive summer (outside of the research I’m doing and the traveling I will be doing). I have a long list of doctor memoirs that I’ve been meaning to read, and a lot of other fiction and non-fiction too. I’ve got some crochet projects to complete (well, start), and plenty of brewing/kitchen experiments too. That’s not quite enough though; those are all things I can manage to squeeze in while I’m in class, so I’m going to spend the next few days trying to brainstorm for something new to do that I’d be really proud to have spent my summer on. Still, this summer is already looking to be far better than my last three. I was busy throughout my last three, but also very stressed for a variety of reasons. This summer is very low stress, and it feels amazing. Side note: This blog is not meant to be anonymous, yet at the same time I hesitate to be unabashedly obvious about who I am and what school I go to. It’s not hard to figure it out but I don’t yet feel comfortable spelling out certain details. I also don’t want people googling my school, or my past undergrad, and finding my blog. Something about that seems strange and undesirable. So my occasional side stepping around outright saying things are not my trying to hide things altogether, but merely to deflect away the attention of search engines. The speaker at my boyfriend’s graduation, (a former president by name of Bill), was, unsurprisingly, a very good graduation speaker. There were many points worth remembering, but the one on my mind right now is how we tend to surround ourselves with people who think the way we do. There is so much information on the internet and so many different opinions, and yet we all have our circles that we travel in and we only expose ourselves to a small fraction of what’s out there. I am acutely aware that I do this, and occasionally I will venture out and try to understand why other people think the way they do. So I understand, for example, why some people are so against the idea of universal health care, and that it simply stems from a very different set of core values than mine. The other day I came across, via twitter, the blog of a young woman, a senior at a Christian University, and couldn’t help but read all her archives (~1.5yrs of posts) in fascination at how different we are and yet, she’s not a bad person. She seems, in fact, to be a very nice, caring person. But we are so, very, very different, and it is a good thing to remember that difference does not equal bad. I would hesitate to call myself a feminist, but I believe in a woman’s right to choose, and no, not just to choose whether to have an abortion, but to choose what path her life will take. To marry or not, to work or not, to have children or not. This other woman believes quite differently. She believes that education, even up to college, is valuable, but that ultimately, a woman’s place is in the home, raising her children and taking care of her household. She believes in homeschooling, and she thinks that birth control is on par with abortion because they’re both about not wanting children that God wants you to have. She is distraught that she has recently broken up with the young man she thought she would marry, and now will have to work after she graduates because she is more conservative than her parents (how does this happen?) and they would not be happy with her returning home and waiting till she finds a husband. She is vehemently anti-feminist. Which then led me to read a bit about the anti-feminist movement, but at that point I’d had enough of reading the opinions of people who disagreed with my life plan. I read just enough to see that they did believe that some women are “called” to work (for example, it is good to have female doctors) but in that case, they then shouldn’t be mothers. It greatly offends me to be told that because I am a woman who wants a career, I shouldn’t have children. The first time I heard anything like that was actually from a very good college friend of mine. She believed that if you want children, you should stay at home to raise them. I’m not sure if she still feels that way (she herself did not want children and did want a career, and had a stay at home mother); I was very upset the first time and just never brought it up again. In general, I’ve found that those who had stay at home mothers are the strongest supporters for them and against working mothers, but as the child of a working mother, I will say that I felt very loved and well cared for and honestly never thought twice about the whole working mother vs stay at home mother thing until college. I think that it’s great if a family can afford for one parent to stay at home, if they want to, but I don’t think it’s necessary for the raising of happy, healthy, well-adjusted children. So it upsets me on two levels. 1) I believe that both parents can work and still raise children well, and 2) It doesn’t have to be the woman who stays at home. I have no delusions that as a woman, I can truly “have it all.” There will be sacrifices, but I think my mother has done a good job of letting me know that it will be hard, yet that it is do-able to find a balance that does right by your family. And this is why it is so much easier to stick to the circles of people who agree with you. Being disagreed with, especially when it is personal, is upsetting, and it can feel like you’re being attacked. Still, I am glad that I read that girl’s blog, that I got to see her as a person and not just as some evil person who thinks that my life plans are wrong. And so ends my first year of medical school. This year has gone by quickly, but maybe it’s misleading in that really, it’s been a school year and not an actual year. Medical school has been a great experience so far, though I’m momentarily finding myself balking a bit at the prospect of three more years of school followed by anywhere from 3-7 years of working but really, still being in training (and yes, I realize you never really stop learning). There are some people who love being in school and who love the idea of it, and I’m not really one of them (though I’m not one of those people who hates school either). I am, however, someone who really likes the idea of working. Having a job. Bringing in my own money. Being out in the “real world.” I know this is still the real world too, but… there’s something different about it. I’ve just come back from my boyfriend’s graduation (which was actually very enjoyable; I’ve been to nearly all my older brothers’ graduations, but I never knew much about what they went through to earn their degrees. This was the first time I’ve gone to the graduation of someone I’ve really watched earn their degree and it adds another measure of significance to all the pomp and circumstance) and being around so many young graduates about to embark on new career adventures has me feeling a tiny bit of envy. No regret, just a little garden variety grass is greener envy. I have been told that next year will feel less like College 2.0 and more like Medical School, because we will be learning Cool Stuff, Real(er) Medical Type Stuff. And even if it still feels a bit like college, it will only be months away from Third Year, which will be when I really start to understand what exactly I have signed my life up for. 10 months ago (!) I started medical school. Almost exactly 3 years from now, I will be a Doctor of the M.D. variety. I will be 26 years old, but I will probably still look like a college student. Three years sounds like a long time until I realize that I graduated from undergrad two years ago and yet it feels like only a year ago, because this past year really was a whirlwind of shiny newness. Every now and then, instead of a lecture, we will have a panel consisting of two or three patients and usually one or two doctors. I really enjoy hearing other people’s stories, and that’s usually what these presentations are. The conditions are always chronic to some degree, so we get to hear about their life from the onset of the disease on, sometimes even before the disease, and sometimes they’ve had the disease their entire life. Last week we had two separate patient presentations that were both amazing for different reasons. The first panel we had two women with schizoaffective disorder, and two doctors, one a psychiatrist, who volunteer/work at a center that’s a big part of their lives. Back in college, I remember learning that there are certain psychiatric disorders, like schizophrenia, where people who have them actually tend to do better in poorer countries where living is still more village style, and they’re kept a part of the family and the community. While they still very much have the disorder, something about staying connected helps keep the disease in check and they are much more functional. I always wondered why there weren’t programs that better provided that sort of support for people with mental disorders in more developed countries, as opposed to just medicating the hell out of them. So back to the panel. It turns out there are centers that provide exactly that kind of support. And it’s not the only one that exists! They’re called Clubhouses, and no, they’re not a home, but instead they are a place where the members work alongside the volunteers to provide a variety of services. It’s a community support model that empowers its members, allowing them to feel both independent, but also healthily inter-dependent. They have a base for emotional support, and they also have responsibility (ie, employment). I think it’s wonderful and I’m so happy it and others like it exist. Google the Clubhouse model of psychosocial rehabilitation if you’re interested in learning more. And don’t get me wrong, the medications are still very important. But they’re just the beginning of the treatment. The second presentation was on Cerebral Palsy, something I was only dimly aware existed on as wide a continuum as it does. There was at least one girl at my undergrad college who seemed to have it, but I’ve never really known anyone who did. What was really cool about this panel then was that we had two patients with Cerebral Palsy, and the doctor had it too! They represented a good range of the disease, and none of them had any cognitive impairments (as is true of the majority of people with cerebral palsy); just the disordered movement. It’s hard for me to concretely say what I learned from these panels. They were interesting, fun, and inspiring. They are to our lectures what the human interest segments are to the nightly news. And I wouldn’t do away with them. The patients are great people for being willing to come in front of a good hundred or so medical students and talk so personally about their lives, and I’m thankful for the chance to get to know them a little bit, even if the getting to know process isn’t mutual. A college friend of mine is an iPhone hacker of sorts (you know how you can get Android on some iPhones now? Yeah, that’s him) and advertised my last post on twitter (I had advertised it to my modest number of followers, he then re-tweeted me to his ridiculous number of followers). I might not get any repeat readers, but there’s something awesome about knowing over 600 people have at least glanced at one of your posts. Today has been a decent morning. I’m leaving town for five days to go to my boyfriend’s graduation, so today is lots of errand running and tweaking my packing. Our college has too many ceremonies, in my opinion, but the good thing about too many ceremonies is I get to wear a bunch of my dresses that I haven’t worn for a long time (ie, not since my graduation two years ago. Wow, two years ago?!). I even discovered that this really nice embroidered denim jacket my mother gave me that I don’t wear nearly often at all (ie, not for a few years now?) matches two of said dresses, so it finally gets to be worn again! It’s weird though, leaving town while school is almost over. I almost never went anywhere during college, let alone right before an exam. I’ve kept on top of my work though, and I’m confident that even if I don’t study while I’m gone, I should still be okay for my test next Wednesday. I will study though, probably not as much as I would like to, but I will get some good productivity in. Aiming high. In a different way than about our Neuro test, I’m a little worried about our next Standardized Patient (SP) exam. We have, supposedly, learned how to do a full neuromuscular work up (ie, the orthopedic and neurology physical exams). Supposedly. I don’t know about you, but it’s kind of hard for me to fully absorb what to do from watching an Orthopedic surgeon and then a Neurologist walk through a professional, complete exam at professional speed. I know we’re not expected to perform the exams at their level of proficiencies, but I feel like it hasn’t really been clear how to perform the exam at our level of proficiency. I suspect my boyfriend is going to be getting a free neuromuscular exam soon. I really need to practice putting all these different skills together in one coherent form. Last time I didn’t practice and I ended up being nervous (for really no good reason) and forgetting to ask my SP about drugs, smoking and alcohol. And of course, it turns out the SPs that time were serious smokers and problem drinkers. At least I remembered to do the sexual history? Significant others and pets are never safe from student doctors. :) I’ve even listened to my bird’s heart with my stethoscope. It was so fast it took me a moment to realize that sound was his heart. I swear I still study! The rest of this post will be misleading, but I am still a med student and not just a serial hobbyist. I’ve actually been surprisingly productive lately. My boyfriend’s college graduation is next weekend, right before my last test of the year, so I’ve been making sure to keep on top of the material since I won’t have time for my usual last few days cram. I work better with limitations like this. My boyfriend was talking to a classmate about procrastination and trying to be efficient, and she said that being an athlete taught her to be incredibly efficient, because between practice and classes and games, she just didn’t have the time to procrastinate. My college roommate/best friend was like that too. She used to ice skate and even though she stopped in college, she still retained her really good work ethic that she simply had to develop to survive. I’ve been trying to more actively take this to heart, realizing that work expands to fill the time available. There is such a thing as too little time to get something done, but there’s also such a thing as too much time. Instead of sitting at my computer all day waiting to be productive, I’ve been better at letting myself do other things (cook, read, watch shows on hulu/netflix, etc) that give my day more structure and allow me to better transition to “okay, and now it’s time to study” because there aren’t that many hours in the day and it needs to happen at some point. It’s been rainy lately, which generally leads to my remembering to read a bit more often. I prefer to read in my armchair in my bedroom, bought mainly for this purpose, but my parrot (a Green Cheek Conure) lives in the living room and reading there is a nice way to spend a bit more time around him. 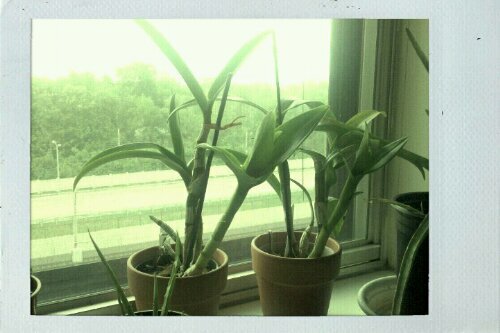 If you look closely you can see the raindrops on the window around the level of the plants. This picture was taken during an unexpected thunderstorm, of which there’ve been many lately. A few nights ago I was actually woken up around 4am by a really loud thunderstorm. Lightning every few seconds and it was raining too hard to get a picture through a window (and there was no way I was opening a window). I really enjoy thunderstorms. =) Although unfortunately, the rain this weekend interfered with my and my roommate’s plans of going to the Renaissance Faire on Saturday. We’ve both never been to one and it should be fun. Thankfully, it’ll be open for a few more weekends so we should be able to go before it ends. The non-orchid plants are my roommate’s, by the way. Rosemary, gardenia?, basil plants, a baby aloe plant, and a bigger aloe plant. 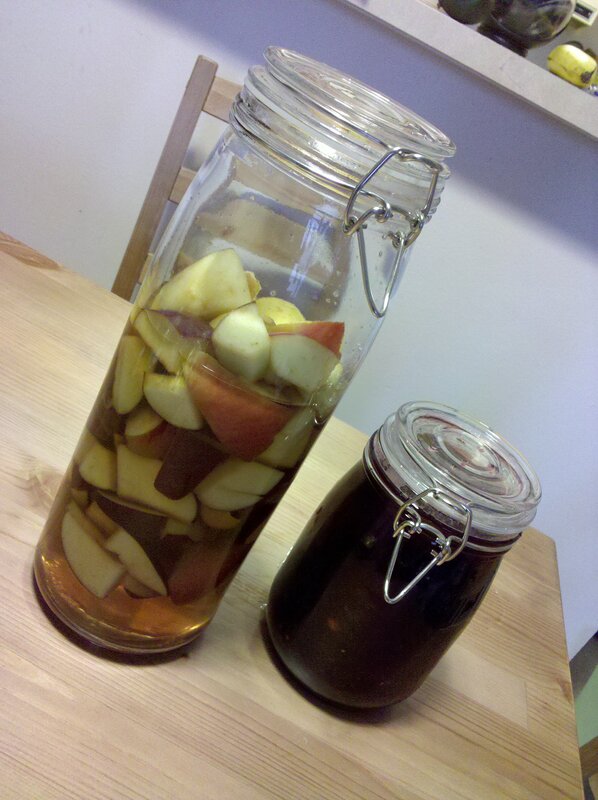 Yesterday I started some new batches of liqueurs. My mead is going to take a while (checked it a few weeks ago and it hadn’t even cleared yet, and I think I’m going to try to wait till the fruit drops anyway before I move it to new bottles to age) and I wanted to have something new around, so I decided to put some of the mottled apples in our fridge to good use (and bought a few new ones too). I’ll be keeping it in a cool dark place for about a month (stirring occasionally), and then I’ll filter it and add some simple sugar syrup (2 cups I think?). I have no idea how I’ll drink this. On the rocks? Mixed with club soda? Most of the fun is really in the making of it, which is part of why half the time I just make them as gifts and keep a little for myself. When I walked into the grocery store yesterday, the first thing my roommate noticed was that blackberries were on sale! 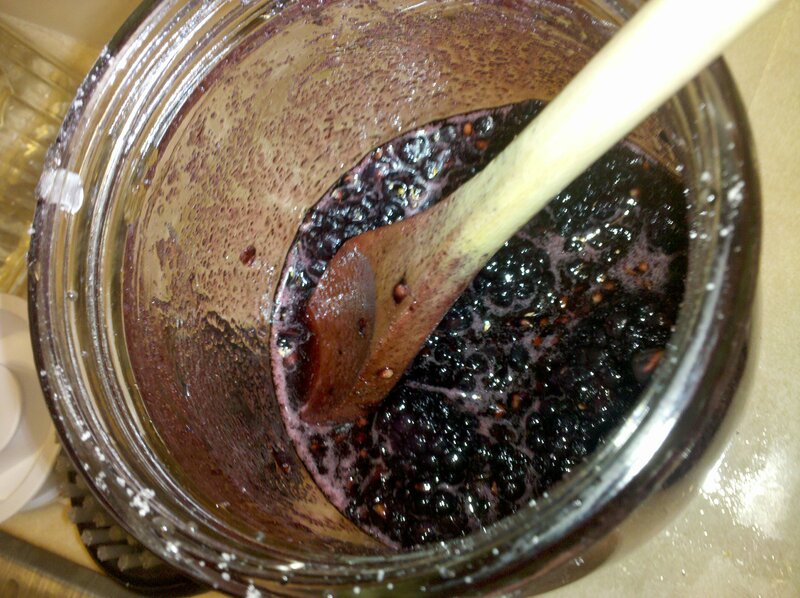 I don’t really eat blackberries (I’m kind of picky about fruit; I like it candy sweet), but I wanted to make something else in addition to the spiced apple, so I decided to make some blackberry liquer too. 18oz Blackberries (honestly, I think 12oz would have been enough, but I had bought 18oz, so I decided to use 18oz). First mixed the sugar with the blackberries, as seen in the picture, then added the alcohol. Again, I’ll let it sit for maybe up to a month (most recipes say 10 days) and then I’ll filter it, and then maybe add about 3/4 cup of water or so. I won’t get much out of this, sadly. Next time I’ll make it in a bigger jar/bottle. I will confess to eating one blackberry out of the mixture before sealing it and putting it away. It was delicious. Again, no idea how I’ll drink this. On the rocks might be too syrupy, but with club soda I’m fairly positive it’ll be delicious. Might also taste great with some vanilla ice cream. I also made some almond liqueur today, which I cheat and make with extracts. I spike a glass of diluted soymilk with it and it’s a really good drink to relax with. Sometimes I add a bit of instant coffee. Boil the sugars with the water until the sugar is all dissolved, then immediately remove from heat and allow to cool completely. Add all the other ingredients. Enjoy! I think my next alcohol project (aside from finally starting new batches of mead; I want to try a cyser/apple mead and either a pyment/grape mead, or a simple show mead. Probably a pyment. Extra flavor to cover up my inexperience) will be skittles/jolly rancher vodka. I’ve been seeing the recipes around for a while and just had them re-recommended to me on twitter. At the very least, the colors will be fun! I am surprisingly (to me anyway) fond of my orchids. In the past… ten or more years, my mother has amassed an enormous and absolutely gorgeous collection of orchids back home in Ghana, and so when I saw that Trader Joe’s sells them for a reasonable price of somewhere under $10, I decided I was going to start investing in my own collection. I got one, didn’t kill it immediately, then bought another which was on sale. And then I stopped, because I wasn’t sure if I’d be around over the summer and didn’t want to leave my roommate with a ton of plants to watch over. Anyway, I’ll be collecting again in a few months, but as is, I really like these two, and I’m so happy that they’re growing. The right most shoots of both plants are completely new. They started out as tiny buds in mid March and now they’re so big! I think I need to stake them to give them a bit of support. I hope they bloom, and I think they will. They’re not in perfect health (I let them get sunburned) but they’re healthy enough to have grown this much. I meant to take a picture of my breakfast, but forgot until it was all gone. I bought the place mat from Ikea since I eat at my desk fairly often and there’s something nice about simple rituals like eating on a colorful place mat. Breakfast this morning was a mug of tea and one and a half of my rolls, while reading a rather charming new blog called All Things ‘Zilla. The mug is one my boyfriend gave me about two or two and a half years ago, that I’m fond of yes, because he gave it to me, but also because I think it’s really pretty and it’s a reasonable size. I don’t pick things with this color scheme often, so it’s nice and unique. 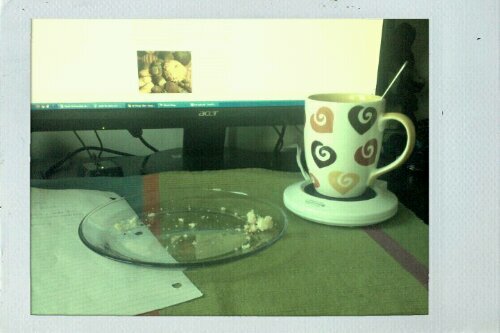 Under my plate are notes I was taking while studying, which I think I need to get back to now. I have some catching up to do, and I also have a test for my little Emergency Medicine class which ends today. It doesn’t matter if I pass or not, but I really like the doctor who teaches it and I want her to think well of me, so I’m going to study for it this afternoon (test is at 3pm). 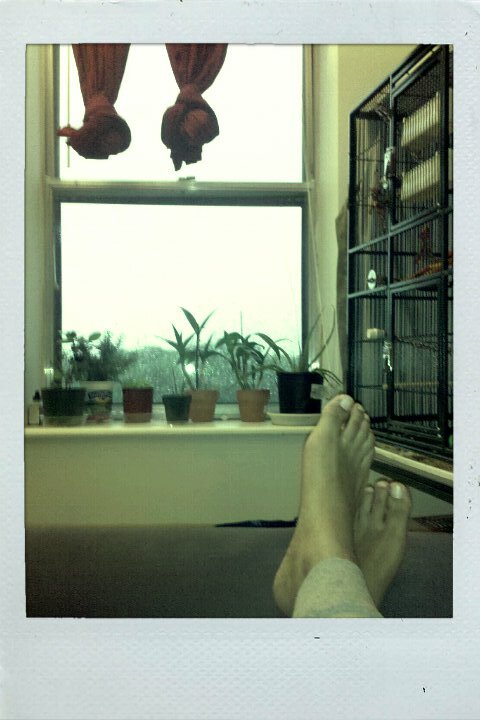 I really like this polaroid effect, by the way. I downloaded a new app for my phone called FX camera, and it has a polaroid mode, which makes these low quality photos so much more aesthetically pleasing. Many of my happiest memories are memories of quietly happy moments, of contentment. Some of them are more singular moments. I vividly recall sitting on my white, wicker armchair on the veranda of our house in Ghana, overlooking our front yard and the street as the sky pours heavy, rain forest storm rain, reading my big Famous Five (by Enid Blyton) hardcover book whose cover I eventually wore into tatters, a plate of peanut butter in my lap, which was draped with a crocheted blanket a co-worker of my mother’s had made for me when I was born. I was maybe eight or nine at the time, and I used to do this often, reading on the veranda, but that one specific time has stuck in my head. And some of them are composites of so many other similar moments, like evenings spent with my mother. My father was often gone on business trips, and I used to move into my mother’s room when he was away. I have so many memories of making tea with her, or eating a light dinner with her, simple, one on one moments. I have very few distinct memories of what we talked about, though we did talk. I think there’s too many of these memories for the general collage to contain that kind of detail, but nothing is lost in the meaning, the core of mother-daughter bonding is still there. And this collage is a work in progress, with new memories added pretty much every time we see each other. We are both habitual tea drinkers, her more so than me (I get lazy about making tea), so it is almost a guarantee that at some point we will find ourselves together in the kitchen, sipping mugs of hot tea, no matter the weather. Today was a good memory kind of day, curling up in the living room on a rainy afternoon with a mug of hot tea, one of my fresh baked sweet rolls that I made because I’ve been craving Ghanaian sugar bread for months now, reading a pretty good book (Water for Elephants). I’ve been working on prying myself away from my computer more often, reminding myself that I have a smart phone and I do not need to be near my laptop unless I am specifically doing something that I actually want to be doing instead of all the other wonderful things I could be doing. Today was also, as you might guess due to this post, a heavy reminiscing sort of day. Rainy days often remind me of that one afternoon on the veranda, and then my boyfriend called to let me know he’d found a new home for our armchair. A little more than two and a half years ago we bought an armchair for my dorm room, a nice big Ikea armchair big enough for the two of us to comfortably share (I’d been wanting one for a long time, due in no small part to fond memories of a green leather armchair I read in often as a child, head resting on one arm, legs dangling over the other). I had the chair for nearly two years, then he inherited it when I moved, and now it’s time for it to leave both of us. My favorite memory of it is probably this one I managed to fall asleep in his lap while he was reading. Though I wasn’t conscious for most of this memory, there was just something very pleasant and homey about it all. I think the moral of this is that I need to make tea and read more often. I was a voracious reader as a child but I’ve tapered off significantly since then. I’m working on fixing that at the affordable price of generally pleasant walks to the library. Ah libraries. The school libraries were my favorite places in my schools in Ghana, and the librarians my favorite staff. I’ve also always loved American public libraries. Strangely, no fondness at all for my high school or college libraries. And now I’m dragging myself back into bed, because it is past my bedtime. In sharp contrast to college, medical school seems to be full of “you’ll find out when you need to know” when it comes to how our education is structured, which I guess makes sense since we all do the same thing and there’s little input on our parts as to how things progress. In spite of the administration’s reticence, little by little, I’ve been piecing together how things go. Today we had another lunch panel with fourth years answering questions. A lot of the questions were more specific than I wanted (like, how we go about getting recommendations for our residency applications. Really, fellow classmates? That’s what you’re interested in hearing about now?) but there were still some interesting things I picked up. Like how in the same way that the second years tell us not to study too much, but actually, we should study, the fourth years told us to do as little as possible fourth year, but then immediately went back on that and said, No, actually, you’re paying for this so make use of it and do electives in things you won’t learn about in your Residency but might be useful, like Radiology (if you’re not going to be a radiologist). I’m always struck by how the fourth years actually do seem older/more mature, because there really isn’t that big of a difference between someone who’s 22/23 and someone who’s 25/26, is there? On second thought, I guess there is a bigger one than expected, because there is something different about my classmates who took a year or more to do something else before starting med school, and many of those who came straight out of college. I don’t think it’s necessarily the actual age difference, but it’s an experience thing. Working changes you. Responsibility changes you. There are of course exceptions to this rule, but I think it’s true of most people. Third year and fourth year of medical school are probably similar kinds of growth experiences. You may not be bringing in an income yet, you may not be truly responsible for people’s lives yet, but it’s a big deal. It’s a big step. I can’t really comment on third years because I don’t really know any. Third years are a rather elusive bunch and we have little to no contact with them. But I can say that the first and second years are very similar but the fourth years are strikingly different from us, right from the start, so I guess it’s third year that does it. It should be daunting and scary, but honestly, I can’t wait. I’ve never been a big fan of classroom learning. I’m ready to start an apprenticeship! (Third year, when I’m whiny and tired and miss having time, please don’t remind me I ever said this. =P ). The year is 1/3 over, and I think I’ve made decent progress with my new year’s resolution. I still waste too much time online doing nothing in particular, but while I haven’t been able to consistently control that habit, I’ve been able to start new habits which have just very simply meant less time to idly browse. I’ve really kept up my spinning (poi, staff and hoop; right now I just have sock poi, a simple tape and tubing hoop, and a fire staff. I’m hoping to invest in led glow poi and an led glow hoop someday), I’ve recently started doing 10 minutes of yoga every morning, and I even made flossing into a daily habit again! I’ve also been pretty good about writing in my physical journal this year. I started it in 2008 and already this year I’ve written more than in 2008 and 2009 combined. In terms of school work, I’ve definitely made marked improvements with trying to do a little bit of work every day. Only having one real class this block has really helped with that, though. It makes it easier to clearly identify what I need to focus on. Speaking of focus, that’s still an issue with me. While I’ve done a good job getting into the routine of studying every day, I still really need to work on focusing on what I’m studying, on actively learning instead of passively skimming and only incidentally retaining what I just read. I need to stop being overwhelmed by the dozens of images of the brain and just seriously tackle them one at a time and commit them to memory. It’s been interesting seeing the drastic improvement in my mood when I have a project of some sort. It can be learning a new staff trick (the Halo Roll! Almost got it. Not sure why it’s named the halo roll though) or trying to figure out how to make mead (it’s still brewing) or reading a new book series. Whatever it is, I really need that specific extra something to keep my mood baseline in the positive range. I think this is why the summer I took General chemistry, the summer I decided to go into medicine, was one of my happier summers. My project was doing well in that class even though I started a week and a half late. It kept me busy for part of the day, and then there was always homework at night. Keeping busy is an incredibly significant part of how I stay happy. For the past week or two I had hit a low where I rather impressively managed to keep up with my daily goals despite hitting a low in terms of my mood. But I think I’ve begun to pull myself back up and throw myself into new projects. I just had a great weekend where not only was my boyfriend in town, but so were the girlfriends of my two classmates I hang out with the most, and we had a fairly full schedule of group activities. This lead to my slacking a bit on my daily goals, which then lead to my being eager to get back to my daily routine come Monday. Win-Win situation all around. Amazing weekend off = better mood and renewed motivation for my daily life. I can live with that.